In September 2017, a statewide team of scientists released the first Montana Climate Assessment report - an excellent, detailed look at the ways our climate has changed and projections for the future, with a particular focus on impacts to agriculture, forestry, and water. Future reports will focus on other industries, including recreation and tourism. The impacts of climate change can be hard to see and understand. Analyzing long-term trends and comparing historical conditions to current data tells us how our climate is changing. These long-term trends also influence the short-term variability of our weather from day to day and year to year. In Western Montana, we’ve already seen changes in our temperature and precipitation patterns. Click the links below to learn more about some of the local impacts of climate change. In Missoula, the average annual temperature during the 20th century was 44.3 degrees Fahrenheit. But every year since 2000 has been above that average – by as much as 2.5 degrees in 2015. Hotter average annual temperatures means summer temps are hotter too. 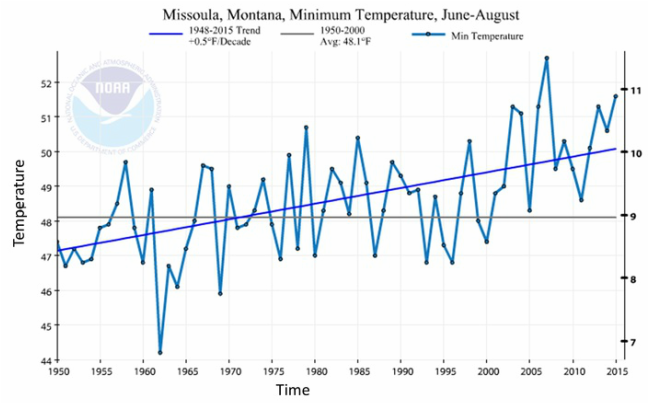 Average June through August temperatures in Missoula over the period 2000 – 2015 were 2 degrees hotter than the 20th century average. Two degrees may not seem like much, but even a small temperature increase can have significant effects. When the average temperature is higher, that means the extremes are higher, too. But nighttime temperatures are warmer too. It's not your imagination - we're not getting as much of a break from the heat overnight. The upward sloping line on the graph to the right shows the trend of warmer average minimum temperatures during the summer. Public health officials warn that hotter nights can make heat waves even more dangerous. 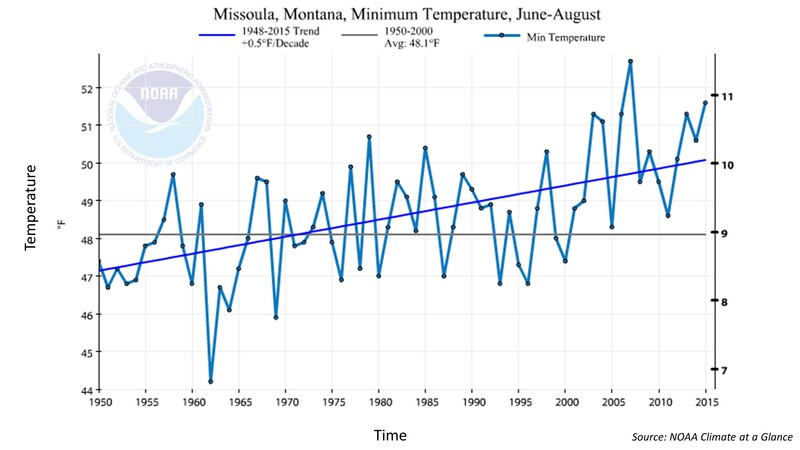 2015 was the hottest year on record here in Western Montana, coming in at a whopping 4.2 degrees F above the 20th century average. 2016 wasn't far behind, with an average temperature more than 3 degrees above the 20th century average. Globally, 2016 was the hottest year on record, and 2017 is shaping up to be another record-setting hot year. Changing rain and snowfall patterns across the entire Pacific Northwest impact our watersheds here in Western Montana. Here in Missoula, we haven't seen a statistically significant change in our total amount of precipitation. But as temperatures have increased, across our region more of our precipitation is arriving as rain instead of snow, which has a significant impact on our valley. Mountain snowpack is an important part of the water cycle, helping to store water needed for irrigation, drinking water, hydro-power, and more. Reduced snowpack is a trend affecting the entire west, and especially the Pacific Northwest. At both lower elevations (2,000 to 5,000 feet), and higher elevations (above 5,000 feet), about two thirds of weather stations across Washington, Oregon, Idaho and Montana are seeing a lower percentage of winter precipitation falling as snow. Overall, 66 percent of Montana weather stations have seen an increase in rainfall as a percentage of winter precipitation. Roll over the map below (left) to see how we stack up to other states. 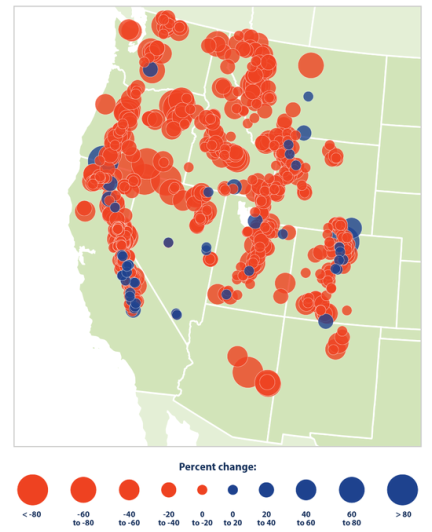 All the red dots on the map below (right) indicate places where there's less snow - click through to see recent research on snowpack trends in the West. ​​Warmer winters come with their own challenges – like icier ski slopes! But warmer and rainier winters also have a major impact on our summer conditions. It's challenging to predict precipitation patterns, but whether climate change brings wetter or drier conditions to our region in the future, warmer winters mean reduced snowpack and earlier spring runoff, which in turn means less water is available in the summer when demand is highest. Reduced snowpack also affects stream flows and water for irrigation, and contributes to more intense droughts and wildfires. ​Wondering what these dry conditions mean? We've got you covered - learn more about drought and wildfires. Hotter temperatures and earlier snow melt contribute to dry conditions that fuel wildfires. 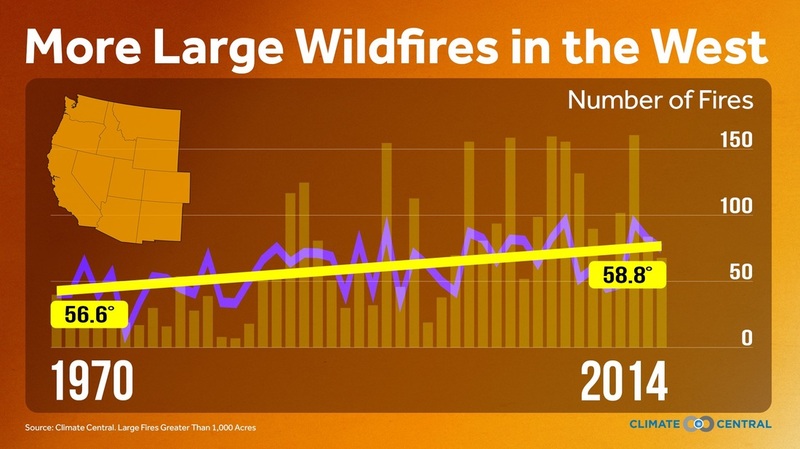 Here in the West, alongside increasing temperatures, the average annual number of large wildfires (fires over 1000 acres) has more than doubled since 1970, and wildfire season is now an average of 105 days longer. This trend is particularly extreme in the Northern Rockies, where large wildfires are 10 times more common and the area burned is up to 45 times greater. ​Even when wildfires aren’t burning, hotter temperatures carry the possibility of increased amounts of ground-level ozone, making our air less healthy to breathe. No one can predict future climate impacts with complete certainty, but climate projections for our region give us an idea of what to expect. Over the next century, fire season is expected to get longer, and fire danger and drought are also expected to increase. "Smoke waves", defined as two or more days of unhealthy air, are likely to be longer, more intense, and more frequent. We are likely to see an increase in mean air temperature of between 2 and 5 degrees F over the next 20 to 30 years. In addition to hotter temperatures, we may see increases in winter precipitation, decreases in summer precipitation, and earlier and greater spring snowmelt, widening the gap between peak runoff and peak water demand and fueling more intense wildfires. 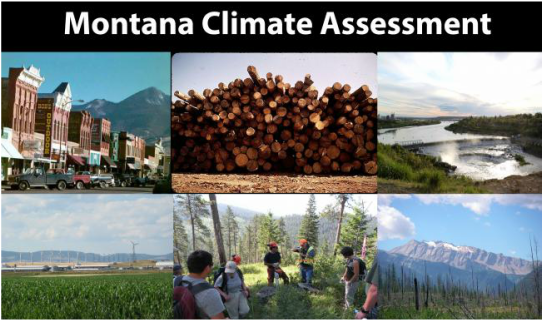 Researchers at the Montana Climate Office have just released the first Montana Climate Assessment, focused on climate impacts to agriculture, forests, and water resources. Check it out! ﻿These local impacts are just part of the bigger picture of global climate change. Heat trapped in Earth’s atmosphere by greenhouse gases impacts global climate patterns – so it makes sense to talk about global climate change and global warming. On a global scale, warming trends are clear as day. The average surface temperature across the planet increased by 1.6 degrees F from the 1880s to 2014. The 21st century continues to smash records left and right: not only was 2016 the hottest year on record globally, but 16 of the 17 hottest years have occurred since year 2000. August 2016 was the 16th month in a row to break all-time global temperature records - a record hot streak in itself. Check out this time-lapse from NASA (left) to see how temperatures have increased across the globe since the 1880s. Wondering what summer climate impacts across the globe look like? Check out this recent photo essay that pulls it all together. Bummed about hotter and smokier summers? We've got lots of tips and ideas about how to "weather the weather": learn how to be summer smart when it comes to heat, smoke, shade, and more. Interested in learning more about how our climate is changing? There are many excellent resources on local, national, and global climate change indicators and projections for the future. Here are a few we recommend checking out. 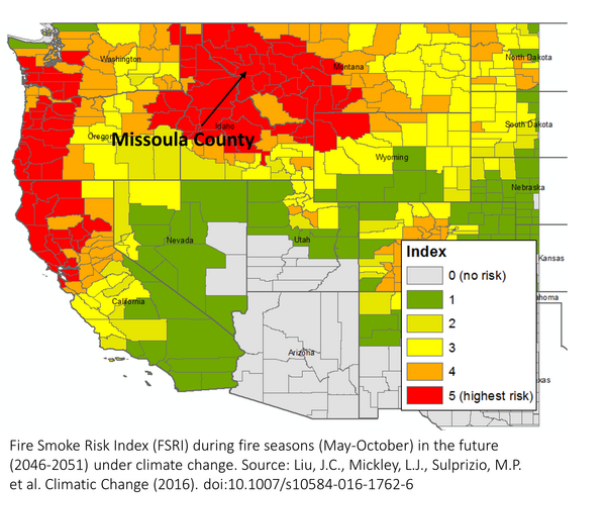 Missoulian: "Something in the Air: Study Finds Wildfire Smoke Problem Intensifies with Climate Change"